Feral Pigeons are generally gray with slightly iridescent feathers on the neck that shine pink and green in the sunlight. Coloration is variable with many mixtures. Pigeons average 3-5 years in the wild. Pigeons are found in many habitats including desert, forest and grassland areas. 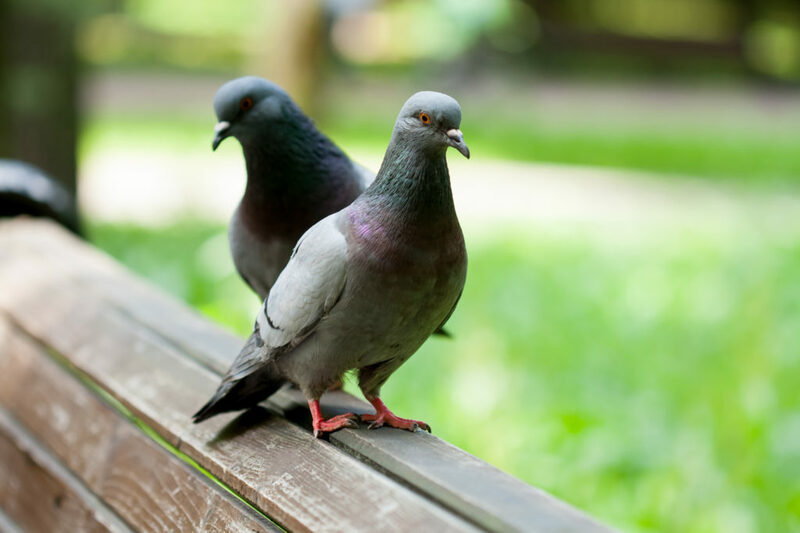 Pigeons are also commonly found in urban and suburban settings.There are many humane options for deterring pigeons from landing or nesting. It is important to do a good clean-up of any bird droppings or nesting materials before any product is installed. Pigeons are found in many habitats including desert, forest and grassland areas. Pigeons are also commonly found in urban and suburban settings. Install bird deterrents such as Bird Spikes or Bird Netting to block pigeons from getting back to the area they have chosen to roost, perch or nest. If you make affected areas inaccessible, the birds will be forced to move on to a new location. Physical bird deterrents like Bird Spikes are effective on ledges, beams, signs, window sills, roof lines, eaves, and other areas pigeons have decided to land. Electric track systems like such as the Bird Jolt Flat Track and Shock Track are ideal for treating ledges and rooflines or anywhere aesthetics are a concern. If you don’t have the time, resources or expertise to solve your bird problem, Double D offer bird control as a service. Common grackles are found in open areas with scattered trees, in forest and urban areas. They can also be found in farmlands, orchards and swamps, savannahs, suburban and agricultural settings. Grackles are commonly found in trees. You can deter grackles from trees using the Bird Chase Super Sonic, a weatherproof sound deterrent design for large open spaces. Remove dead or dying trees from your property that double as grackle roosts. This will send the birds on to find a new home. Sound deterrents like the Bird Chase Super Sonic are ideal for dispersing grackles from trees and other areas. Visual deterrents such as the Hawk Decoy, Predator Eye Balloons, Reflective Eye Diverters or shiny reflective objects can be hung in trees to scare off grackles. Double D can professionally install bird control products and offer other services such as clean-up and humane trap and removal. Crows live in tight knit communities that work together to defend their territories. They may choose a high point on your home or building as a lookout point. Keep crows off roof lines and ledges by installing Bird Spikes, Bird Jolt Flat Track or other physical bird deterrents to prevent them from landing.